“It was with great fanfare a few years into the American invasion of Iraq that plans were announced to build America’s largest embassy, in the Green Zone in Baghdad. The embassy itself would cost over one billion dollars, and occupy more land than the Vatican. The U.S. ambassador of the time boasted it would be seen from space. As America’s largest embassy, no, the world’s largest embassy, it was to be a symbol of American might and power dropped smack dab into the heart of the Middle East. That it sat on land conquered­ taken­ from Arabs was part of the point. The U.S. Embassy in Baghdad was also a symbol that the State Department, left out of the Neocon fury of 2003, was going to be a player in Iraq’s future, and indeed in America’s broader plans for the Middle East. The military would soon withdraw (they thought) to a string of permanent bases large and small across Iraq, but the embassy would stand proud and big in Baghdad forever, full of important State Department staff doing important things for the United States. Daddy liked the State Department once again, and to make up for all those bad, bad things Daddy once said, had bought the State Department the world’s largest embassy as a welcome-back gift. As the Iraq War crumbled underneath America, State still clung to the plan. Thousands of diplomats and contractors were flown in to fill the embassy which, even at its massive size, was still too small to house them all. At one point the State Department had close to 20,000 personnel on its pay roll in Iraq. 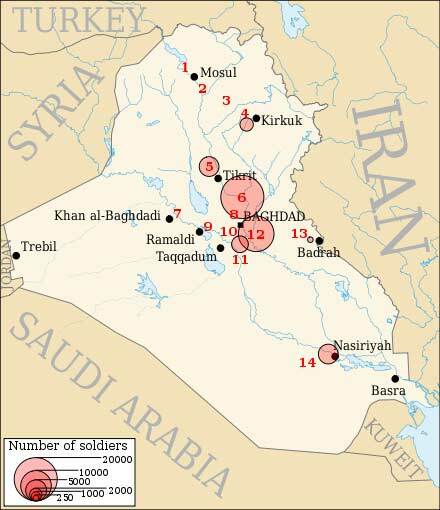 The war ended (for America) and the mighty U.S. military quietly slunk out of Iraq. The Obama administration began pretending like Iraq never really happened, devoting it no intellectual capitol and no bandwidth as it turned its attention to “winning” in Afghanistan. The Iraqis returned the favor, turning down American training programs and sidelining U.S. diplomats in favor of their Iranian counterparts. Everybody seemed to be reaching a new normal. When it was created the U. S. Green Zone inside Baghdad was to have been the U.S. headquarters for military and political-operations throughout the Middle-East. The destruction of Forward Base Falcon became the death knell for the Green Zone because the same contractors that built Falcon had been involved in building the Green Zone. When Forward Base Falcon was destroyed, it was clear, that if we persisted the same thing could happen to the largest U.S. Embassy in the world. The scale of the Green Zone was immense. It was and still is the largest embassy the world has ever seen—bar none! 20,000 soldiers were headquartered there, along with roughly 20,000 Embassy personnel, at its height. The reason for this massively armed and focused American-presence within the walls of the Green Zone was long term victory. From there Bush, L. Paul Bremmer, Rummy & Cheney had planned to run all military operations throughout the Middle-East. The total destruction of Camp-Falcon forced them to reverse that plan. Ironically, the attack on Falcon is what made clear the need for massive changes in USI-puppet-regimes that had been in place for forty years, throughout the region. The revolutions of the flawed Arab Spring, in country after country, were about to successfully challenge the US. That necessitated false-flag operations throughout the Middle-East. For forty years US puppets had ruled the Arab countries. By the time we attacked Iraq those puppets (the leaders of most of the Arab states) had proven to be worn-out and were incapable of controlling their Arab populations. In most countries the puppets represented only 5%, at most, of their people. They had to be replaced: The obliteration of Camp-Falcon proved that the puppets could no longer be trusted to control their own people. They had to go! The U.S. & Israel started the false-flags and the falsely named Arab-Spring! The Green Zone, from its central location in the Middle-East, would have been the clearing house for all operations against nations as diverse as Egypt to Libya, as tortured as Palestine to Syria, or as fraught as Lebanon to Iran ­ not to mention the massive new attacks on 22-nations in Africa: Mostly using drones to this point. Forward Base Falcon demonstrated to the world on October 10, 2006 that Iraq was not controlled to the point USI had deluded themselves into believing. That attack clearly meant that unless things changed the U.S. Green Zone would be next! It was then that mercenary-services began to take center stage. The drawdown of US troops had become inevitable. Destabilization across the region began to replace the 40 year dominance of the old regimes. All of this was necessitated because when Bush & his ‘Partners-in-Tyranny’ realized that an attack on the Green Zone would be fifty-times worse than the Vietnamese Attack on Saigon (which ended the Vietnam War) - Bush & the Zionists would be arrested and charged with TREASON! But the USA would have suffered a permanent defeat that would have ended everything that was planned for the hyper-success of the old-new world order. It was this altered Middle-East plan which led to the false-flag revolts in country after country while USI-Israel began new land grabs throughout the region - again. Under new leadership but still dripping with violence, riots, and destabilized countries throughout the region: The true Axis of Evil (US, Israel & Saudi Arabia) reshuffled their long-range-plans yet again. Their efforts are now being called: “Partners in Tyranny”! The murderous effects of our weapons that were used in Vietnam, including Agent Orange, created life-long injuries for the returning soldiers. The vets from Vietnam were draftees. These were people that had no choice to go to war, but who were instead SENT to fight wherever they were conscripted to go. As such; government was responsible for their lives. If they survived, the government was responsible for treating the wounds they came back with. The entire problem with that failure can be seen in the current-battle being fought over the National Home for Disabled and Homeless Vets, in LA. The Veterans are losing to the corruption of the courts, to the judge in this case and to the Zionist-traitors that Amerikans know as U.S. legislators who have chosen to steal over three hundred acres of Veteran’s land ­ which they want to give away for billions and billions in illegal-profits. “…Veterans who pledged their lives to defend our Nation’s freedom have become accustomed to callous and bigoted injustice by our so-called judicial system. While Veterans have little or no faith in Judge Otero, there’s still one Claim left and it’s the illicit agreements used to infiltrate Veterans property, i.e., hacked into for non-Veteran public use. These include the aforementioned arrangements that were misappropriated through unprecedented compromises at the highest levels of the VA, including a Congressional delegation. As a result, it’s expected that Judge Ortero will be consistent and rule against Veterans on behalf of a wealthy and powerful homeowner group that has a privileged agreement to build a public community park on a billion-dollar parcel of Veterans land “rent-free,” instead of the VA building emergency shelter for our disabled and homeless Veterans. This renegade cabal operates under the ruse of being a Veterans organization and secretively manipulated the VA and Department of Interior to declare more than 40 antiquated buildings on Veterans property to be designated as “historic” (many are vacant and rat-infested) and maintain these morbid and disgusting relics just as they are to further ensure that homeless Veterans will never be housed on these hallowed grounds. The arrogant homeowner group shamefully boasts that the VA and National Parks Services have asked them to be stewards across the entire Veterans property providing tourist-oriented services for the public instead of providing permanent supportive housing for disabled Veterans as mandated in the Deed of 1888. It’s time to bring the blood & torture that still survives in the broken and damaged bodies and minds of our vet’s home for treatment. The survival of the draftee’s from Vietnam to the “volunteers” that were lied to and had their deployments extended for years under a pack of lies from this government and in every war after Vietnam. The government needs to honor its own word in the contracts they signed with every soldier!